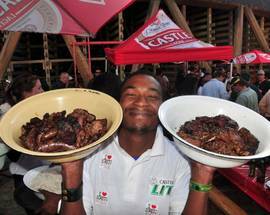 Forget your food allergies, aversions and intolerance and open your palate to the tastes of South Africa. We called in food expert Anna Trapido to make sure you know your koeksister from your walkie talkies. ​Amadombolo Zulu-style steamed dumpling breads served as an accompaniment to stews. Amagwinya Known as vetkoek in Afrikaans, these fried dough balls are similar in size and shape to a doughnut. Often sold by street hawkers and roadside vendors. Amasi isiXhosa and isiZulu term for the soured milk commonly used as a drink or accompaniment to maize porridge. See also ingqaka. Biltong Coriander-marinated dried meat, Afrikaans in origin but consumed widely by all South Africans. ​Bobotie Beef or lamb mince bake, studded with dried apricots and topped with a savoury custard. Disputed origin but probably a fusion of Cape Malay, Afrikaans and Middle Eastern culinary genres. Boerewors Literally ‘farmers’ sausage’ in Afrikaans. Beef and coriander sausage. Boerekos Traditional Afrikaans food genre commonly associated with Gauteng and Free State food. Also known as Transvaal Pioneer Cuisine. Braai South African term for barbeque. Bredie Slow-cooked,usually mutton-based stews seasoned with cinnamon, cardamom, ginger and cloves. 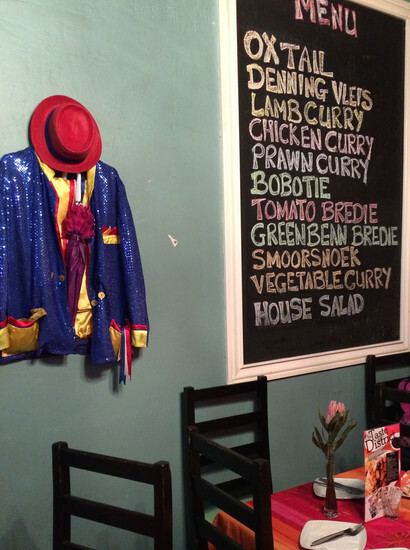 Commonly cooked by people of both Afrikaans and Cape Malay origin. 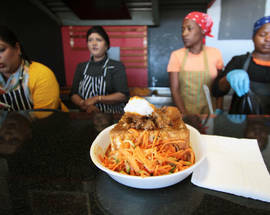 Bunny chow Developed by South Africans of Indian origin. Curry is placed inside a hollowed-out loaf of bread. There are no rabbits involved. The term ‘bunny’ is derived from the Gujarati word ‘bhania’, meaning ‘trader class’. Chakalaka Township vegetable and curry relish. ​Denningvleis Cape Malay-style lamb, tamarind, onion and clove mélange. ‘Denning’ is the Javanese word for ‘buffalo’. Droëwors Literally ‘dry sausage’ in Afrikaans. A snack food, based on the traditional boerewors but usually made in a thinner casing. Gatsby Cape Town-style sandwich made from bread stuffed with any combination of meat, melted cheese, fried eggs, chips and pickled chillies. The name is thought to refer to the flat cap worn by Robert Redford in the film of F. Scott Fitzgerald’s book, The Great Gatsby. ​Hertzoggies Afrikaans-style apricot jam and coconut topped biscuits named after former prime minister J.B.M. Hertzog. The coconut resembles his white, wispy beard. Ingqaka Xhosa-style amasi curds with the whey drained off. Similar to ricotta in taste and texture. Ingelegde vis Afrikaans term for Cape-style pickled fish (marinated in onion, turmeric, masala and allspice). 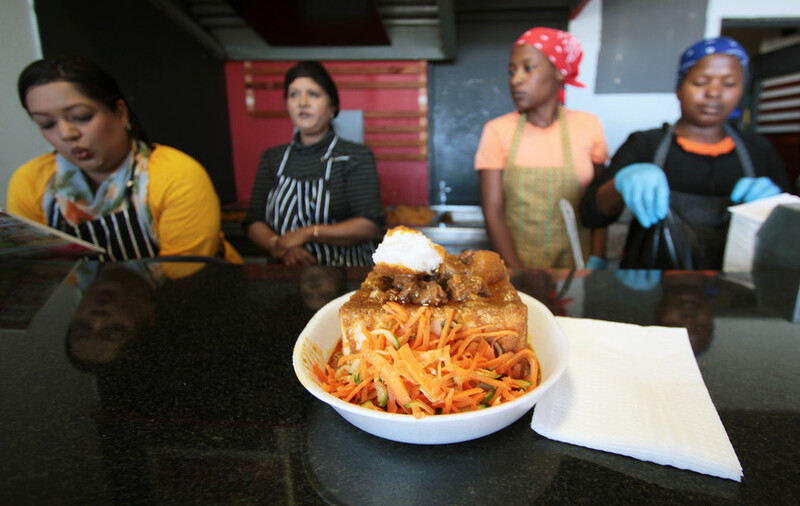 Inhloko isiZulu term for a slow-braised cow’s head. Not to be confused with a smiley. Koeksister Afrikaner-style deep-fried, syrup-dipped plaited dough, while koesister is a Cape Malay-style deep fried, syrup-and-coconut-dipped oval piece of dough. Kota Township sandwich made from a hollowed-out quarter bread loaf. Filled with a variety of meats, chips, cheeses and pickles. Also known as spathlo and skumbani. Krummelpap Afrikaans term for maize porridge with a crumbly texture. 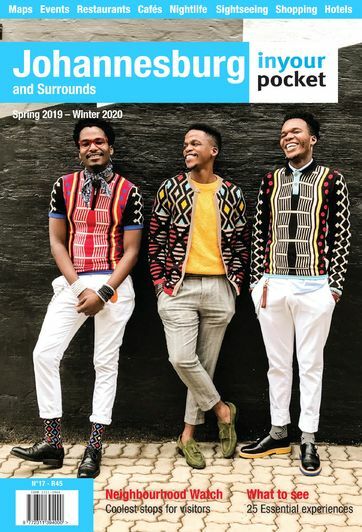 Known in isiZulu as ‘putu pap. Malva pudding The name is derived from the Afrikaans term ‘malvalekker’, meaning marshmallow. Syrup-drenched marshmallow-textured baked pudding with apricot jam. Mealie Afrikaans word for a corn cob or maize plant. Morogo SeSotho term for a variety of wild leafy vegetables. Mogudu SeSotho term for tripe. Commonly braised with onion and salt. Msoba isiZulu term for a South African indigenous fruit (Solanum nigrum) often used in syrups and jams. Referred to as nastergal in Afrikaans. Pap Refers to maize porridge of various sorts. Piri-piri Mozambican and Angolan olive oil, garlic and chilli marinade. Peri-peri is South African emulsified chilli sauce. Potjiekos Afrikaans term for stews made in a cast iron, three-legged pot (known as a ‘potjie’) over an open fire. Rooibos Cape indigenous shrub commonly brewed as a tea but also used as a seasoning ingredient. Roti Cape Malay-style flat bread similar to an Indian roti but considerably lighter and flakier in texture. Russian Cheap, fine-textured pork or beef-based sausage. Originally sold on the gold mines to African migrant mineworkers by 19th-century Eastern European immigrants. Salomi Cape Malay-style curry wrap made with a roti flat bread. Samp Dried, coarsely-broken corn. Known in Afrikaans as stampmielies. 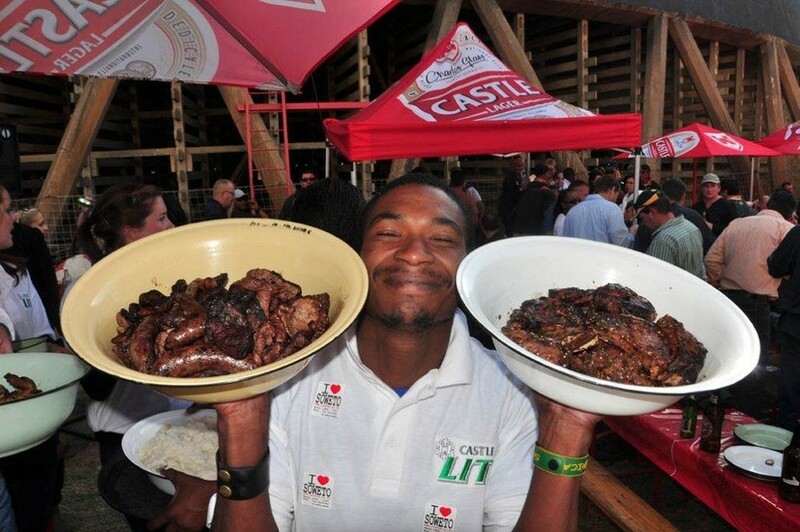 Shisa nyama (also spelt chisa nyama) Township braai/steak house usually with a butchery attached. Customers choose meat raw and sometimes cook it themselves. Slap tjips Thick, fried potato chips sold as takeaways wrapped in paper. Smiley Roasted sheep’s head. During roasting lips retract exposing the animal’s teeth and making it appear to smile. Snoek Large game fish, relative of the Barracuda. 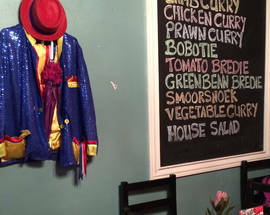 Common in Cape cuisine. Often barbequed with apricot jam glaze. ​Umngqusho Xhosa-style maize and bean mélange. ​Walkie talkies Spiced, grilled chicken feet. Anna Trapido is the author of ‘Hunger For Freedom, The Story of Food in the Life of Nelson Mandela’, and ‘To the Banqueting House: African Cuisine, An Epic Journey’. She is also the former editor of ‘Rossouw’s by Diners Club South African Restaurant Guide 2015’.